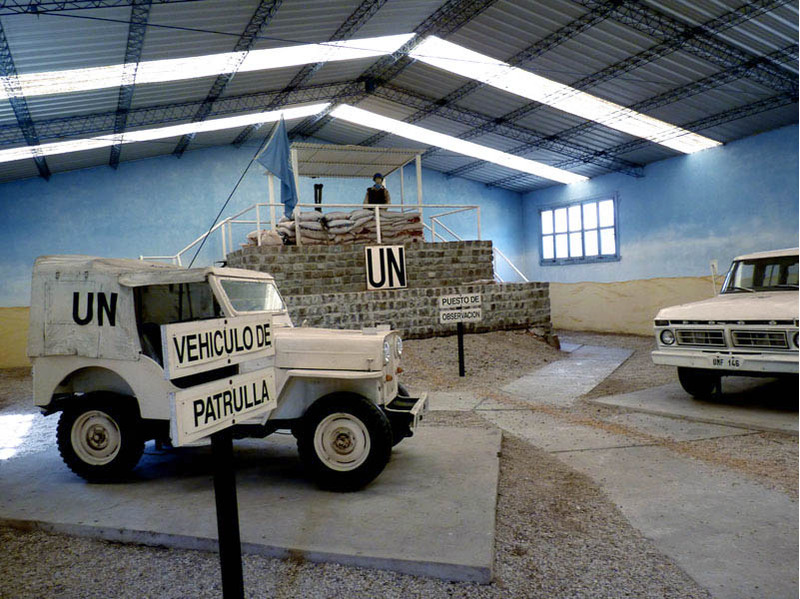 The Museo Histórico del Ejército Argentino ("Museum of the History of the Argentinian Army") in Ciudadela near Buenos Aires, includes a display devoted to Argentinian participation in United Nations peacekeeping over many years. One of the centerpieces is an M606 painted in UN white. The Parachute Infantry Regiment No. 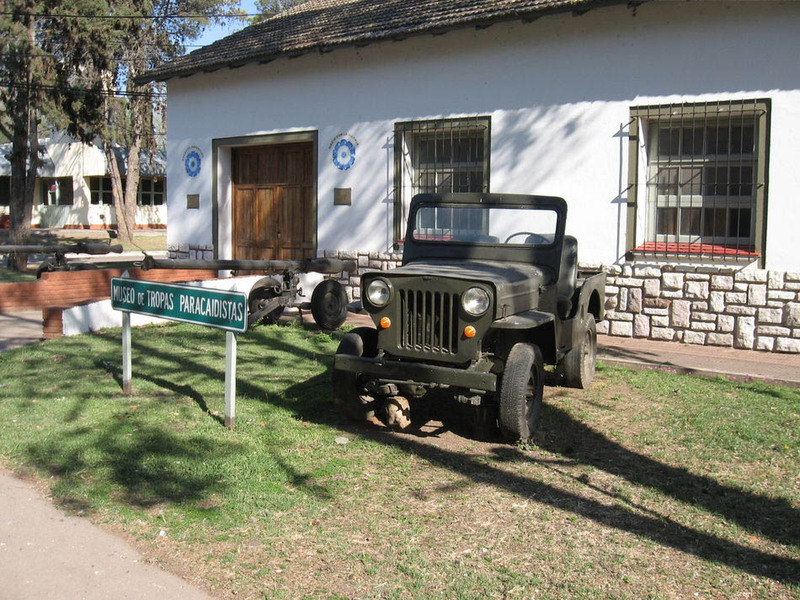 2 has a museum at their headquarters at La Calera in central Argentina, just outside Cordoba where the IKA factory was located. Greeting visitors to the museum is an M606 which is pretty well maintained, but stripped of most removable parts. Photo by Luis Mariano Paz. The Jeep outside pales in comparison to this unique exhibit inside the museum -- an M606 on a pallet ready for airdropping. Thanks to Sergio Willys for this photo. 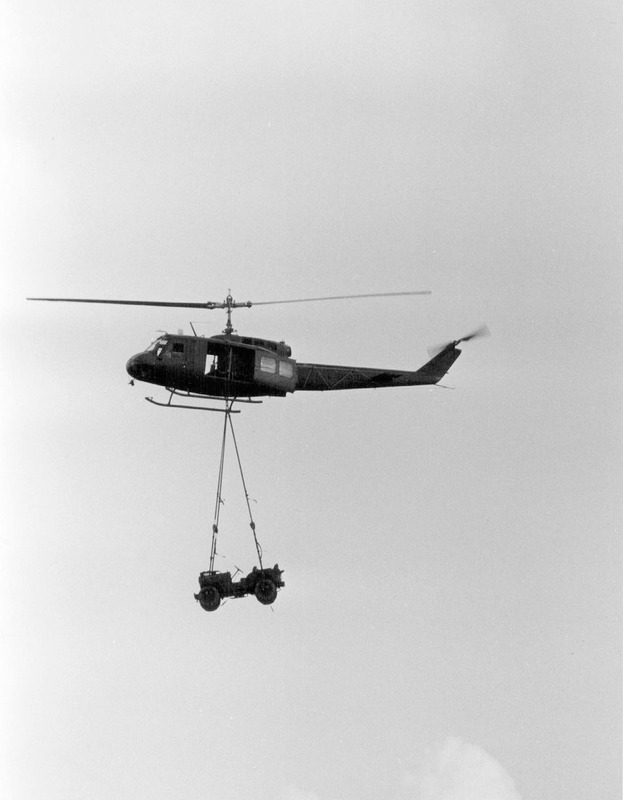 Another way of delivering a Jeep by air: a Bell UH-1 helicopter of the Ejército Argentino lifts an M606 in this undated photo courtesy of Luis Mariano Paz. Luis also passed along this photo of troops from the Parachute Infantry Regiment No. 2 in an Ejercito Argentino M606 Jeep, during a civil disturbance in the city of Cordoba in 1969. 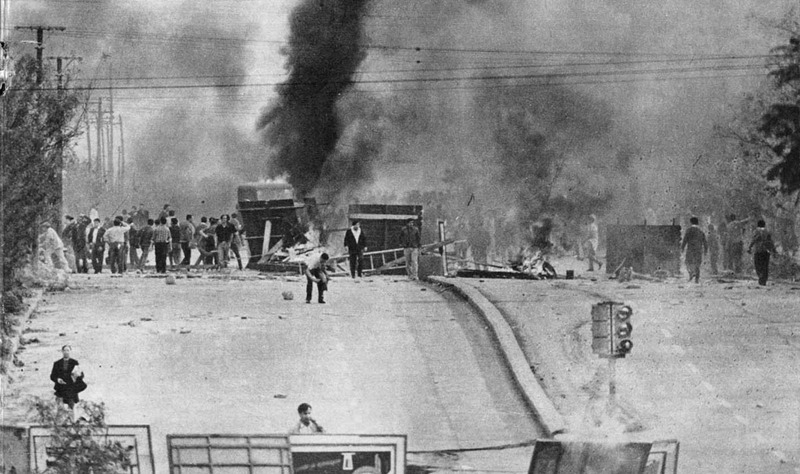 The "Cordobazo" was a protest movement of workers and students, who erected barricades (170K JPEG) and took control of much of the city of Cordoba on 29 May 1969, until the Army was called in. 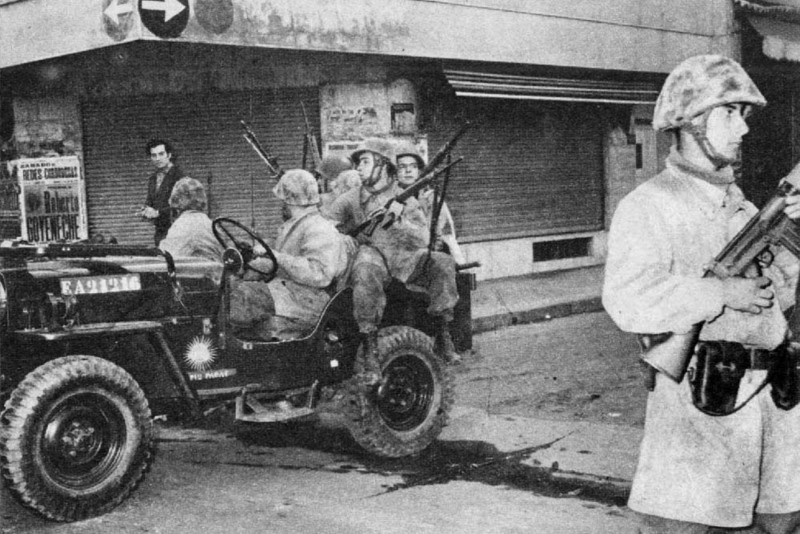 (Wikipedia) Although short-lived, the Cordobazo inspired further uprisings and has been called a turning point in Argentinian politics. 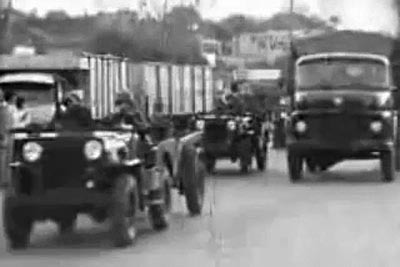 Luis catalogues the vehicles visible in the film clip: eight M606 Jeeps, one with a M100 trailer, a Dodge M601, a Willys Utility Wagon, and a Mercedes Benz 1114 truck. The Parachute Infantry Regiment No. 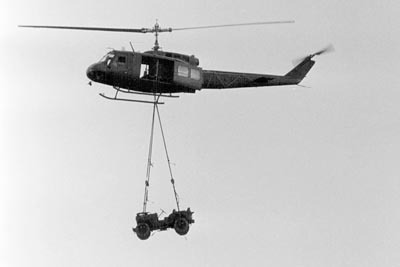 2 was the unit to which Luis' 1966 M606 belonged. 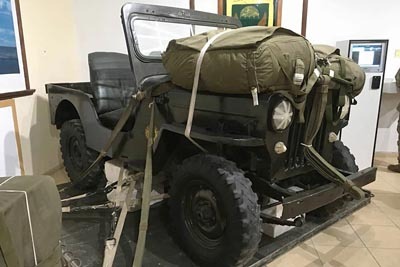 The Jeeps seen in action above, were retired from the Ejercito Argentino by the early 1990's, and Luis sent two photos probably taken in 1993 of army surplus M606 Jeeps up for auction. He says, "I think that this photograph will break the record of the most M606/CJ-3B ever seen in one place." And this is clearly an unretouched photo with at least 20 Jeeps visible (see the large copy, 120K JPEG). The second photo apparently shows the other end of the lineup, and is interesting because several hood numbers are recognizable. 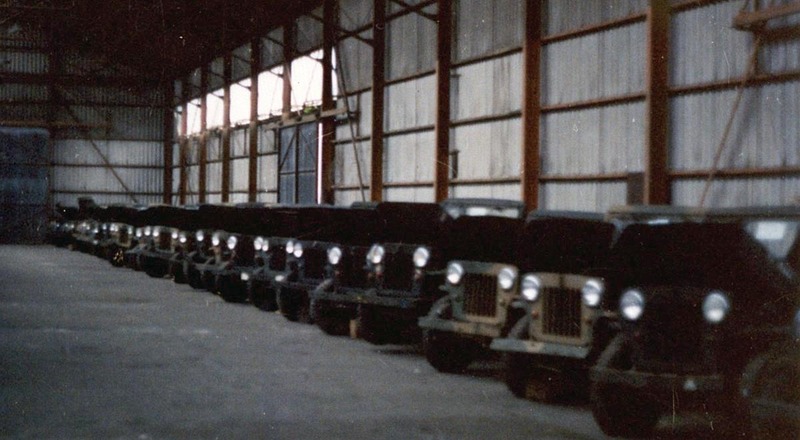 Luis says, "It is not unreasonable to think that my Jeep could have been in this line of Jeeps." December 8, 2000: the year-end meeting of the Asociacion Argentina de Coleccionistas de Vehiculos Militares. December marks the beginning of summer in Argentina, and the temperature averages 25 to 35 degrees centigrade, so it was a great opportunity for four M606-owners in the AACVM to line their Jeeps up, put the tops down, and admire each others' work. Note that two of the Jeeps have their spare tires mounted on the rear. A closer look at Luis Faita's 1967 Jeep, with a jerry can bracket mounted on the passenger side. Photo taken at the same AACVM meet, held at the Gral Lemos Parade Square. Two M38A1s, as well as other vehicles belonging to members of the AACVM, were included in the display. 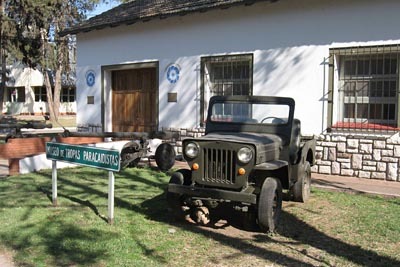 The organization, inspired by similar associations in other countries, was formed in 1997, with the objective of preserving military vehicles as part of the history of Argentina. 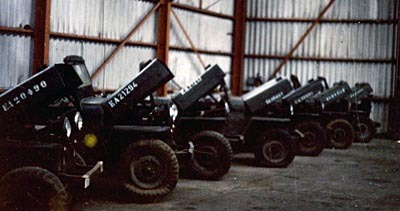 Ejercito Argentino imported approximately 250 M606 Jeeps between years 1964 and 1967, as well as many M38A1 and twenty M170 Jeeps. 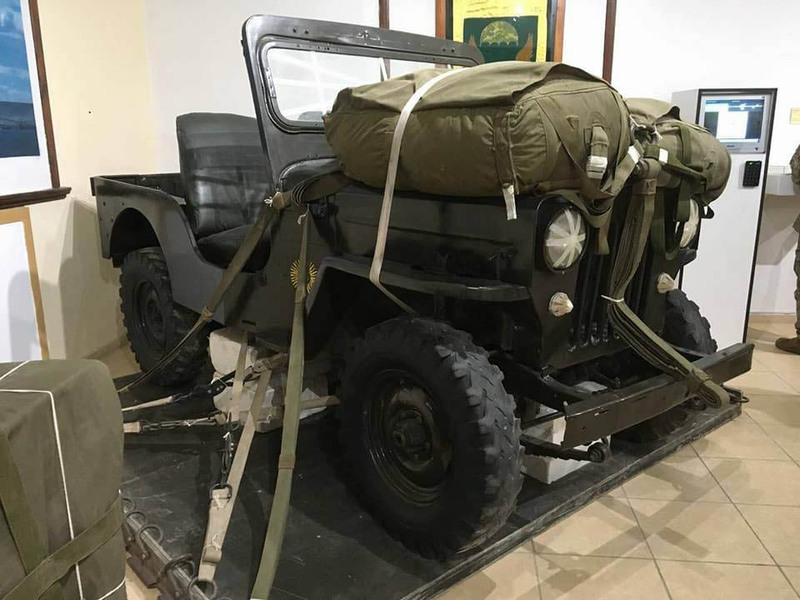 Luis Mariano Paz says, "All the vehicles arrived painted olive drab, and later some were painted the terroso brown color with olive spots, like the M606 in this photo, from year 1967. "Espero que de esta manera los dueños de otros M606 de la argentina se puedan contactar conmigo y formar una gran Asociacion." 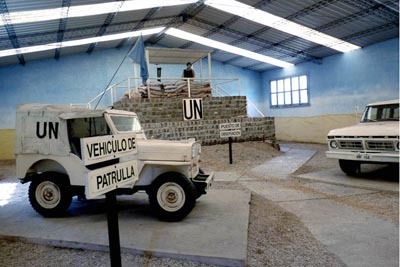 Also on CJ3B.info, see Ejercito Argentina 22071: 1967 M606 -- witnessing Evita and the Falklands.